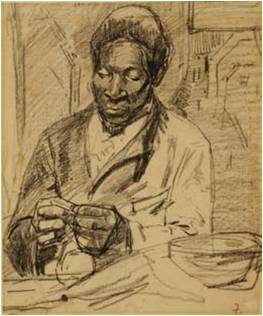 This drawing is one of the few true portraits of the Abyssinian (Ethiopian) Adolf Boutar. He is seated here in western clothing and seems to be rolling a cigarette. The drawing is relatively worked up and the face in particular has been given a great deal of depth. Large areas are hatched and Boutar’s surroundings can also be clearly seen. The setting might be a café. Boutar looks like a worker who has just taken a brief break. to whom De Zwart belonged, also embraced the life of the working classes as a subject. This portrait may have been drawn shortly before or after Boutars posed for the members of the Pulchri Studio society of artists. The word rood (red) is written on the drawing beneath Boutar’s head, suggesting that it may have De Zwart’s intention to work it up later into a watercolour or a painting. In contrast with the images produced by all the other artists who depicted Boutar in paintings, drawings or watercolours, there is nothing exotic about De Zwart’s drawing, unless it is the vague contour of what might be an earring. A painting by De Zwart based on this study of Boutar is as yet unknown. De Zwart was a pupil of Johannes Hendrikus Egenberger and Jacob Maris 1838 –1899. In 1883 he became a member of the Pulchri Studio society of artists, where Boutar posed. He became very friendly with Breitner. In 1885 De Zwart became a member of The Dutch Etching Club. He is chiefly known for his etchings. At the 1889 Exposition Universelle in Paris he received an honourable mention for etching, at the 1894 Exposition in Antwerp he was awarded a gold medal.